Larval food plants are chiefly legumes in the Mimosaceae (Fabaceae) and Caesalpiniaceae (Fabaceae) but a number of other species from different families have been recorded. Mature larvae green to bluish-green with yellow lines and bands and whitish spots; head dull green edged with yellow, plus 4 long horns tipped with blue. 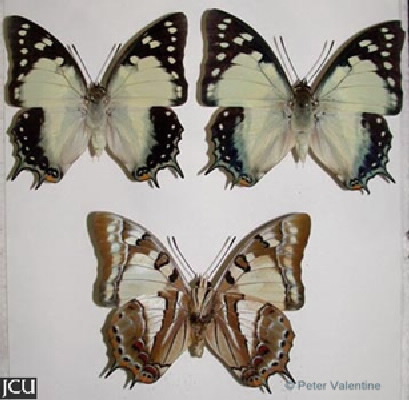 Adult is cream with black areas enclosing spots, on the hind wing the cream is more extensive, 2 tails per hind wing; lower surface cream with brown and white areas, extensive patterning.